By the time I was wrapping up the New York leg of my most recent US trip, I was a bit homesick. I had been in the States for over a month. While I enjoyed exploring the Big Apple, I wanted to end this leg differently before proceeding to my last leg, Pittsburgh. 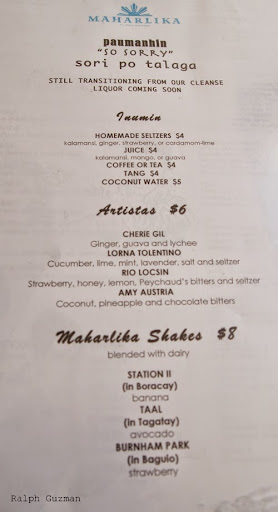 I’ve heard of a number of places offering Filipino food, and they’ve put our cuisine on the map. So why don’t I try it? The irony — it was my seminar facilitator, an American, who recommended the place. She raved about this joint down, down, downtown on 1st Street — East Village (I was past Times Square on 48th and Broadway and stayed there most of the time). 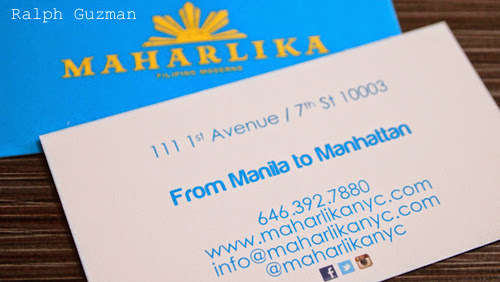 It was a place called Maharlika. 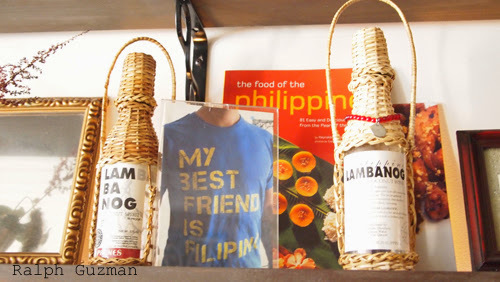 The place is proof that Filipino food can be sophisticated and can stand with pride with the world’s other cuisines. I mean, don’t we often complain that Filipino cuisine does not get the attention it deserves compared to its other Southeast Asian counterparts? The place was no mere carinderia nor turo-turo. 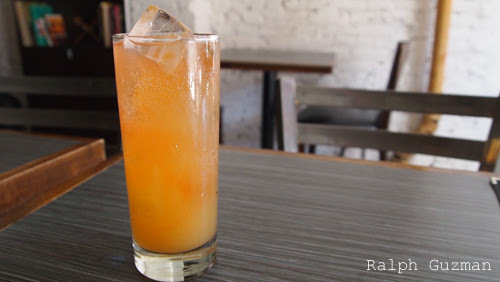 It positions itself as authentic Filipino moderno, after all. 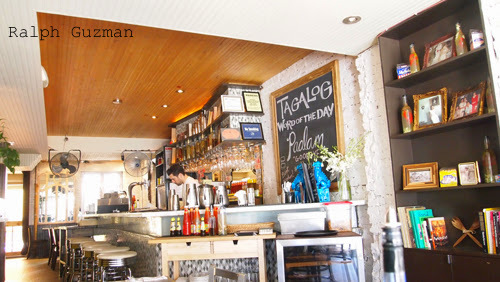 It had the vibe of a hip, contemporary New York restaurant, but it was full of Filipino wit, humor, plus a dash of the homey feel we always find in any Pinoy home. As a Filipino trying out his own dishes in a foreign land, I enjoyed the ambience as much as the food. It seemed as if the place was paying homage not just to Filipino cuisine but all the quirks that come with our cuisine as well as our homes. Why do I say this? 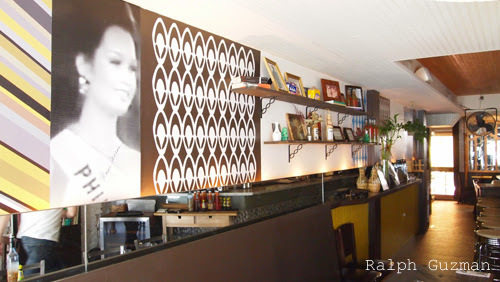 Let’s start with the restaurant showcasing the Philippines’ obsession with beauty contests. A huge mural of Miss Universe 1973 Margie Moran greets you upon entering the place. 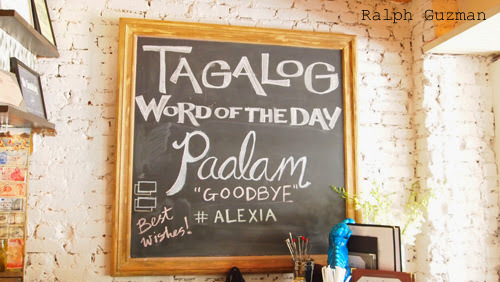 Of course, language is part of our culture, and it’s wonderful that the owners are educating non-Filipinos with a few tidbits of our language. 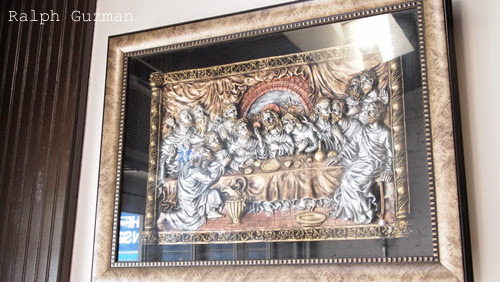 As I waited for my order, I couldn’t help but laugh upon seeing a version of the Last Supper hung on the wall. A version of this was found in each family’s home, and I vaguely remember how each family would try to outdo others by hanging a better-carved, better-designed, or better-lit version of it. While many people have kept the faith, most people in today’s generation have opted to skip this specific work of art (and I am saying this in the most diplomatic way possible. Hahaha). This made me wonder. 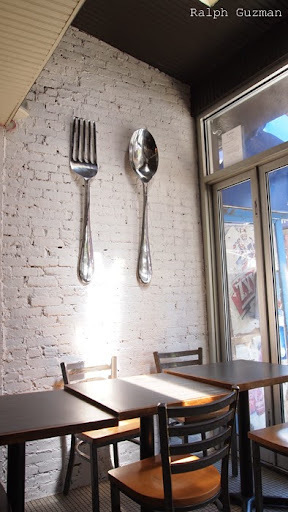 If the Last Supper was part of the stereotypical Filipino home in decades past, what about the giant spoon and fork? Boo-hoo! The place doesn’t have them! Ooops… there they are! I started out with a drink. These were named after veteran Pinoy actors. So was each drink reflective of their personalities? There was Cherie Gil, Amy Austria, and Rio Locsin. Then there’s also Lorna Tolentino, which I had. The LT was cucumber, lime, mint, salt, and seltzer. It was very refreshing drink, and was perfect considering that I so tired after getting lost in nearby Chinatown a few hours before. I then had balut. Well, nothing new here. 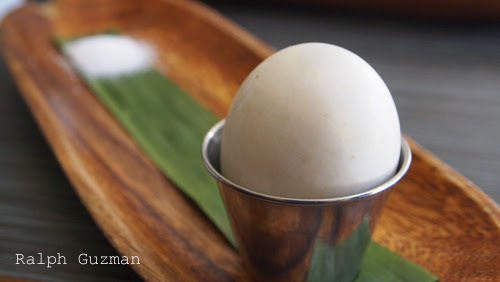 Balut is balut, and it was served in its traditional form — without any modifications or embellishments. I suppose it is to give guests the unique experience we have here. I don’t normally have balut, but you only live once, so I went for it. Balut. What’s inside? It’s not for the fainthearted. I then had lumpiang barquillos. It’s very reminiscent of the lumpiang shanghai we have here, but it’s thinner and longer. I loved the added crunch from the water chestnuts. A yummy twist. 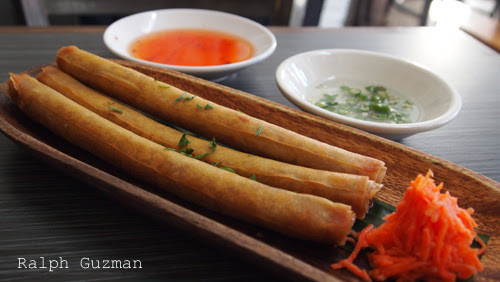 Unlike the normal lumpia (spring rolls) we have in the Philippines, which are short and fat, Maharlika’s version is shaped like thin, long cigars. For my main event, I had Flip’d Fried Chicken N’ Waffle. The chicken was flourless yet it was so crunchy. 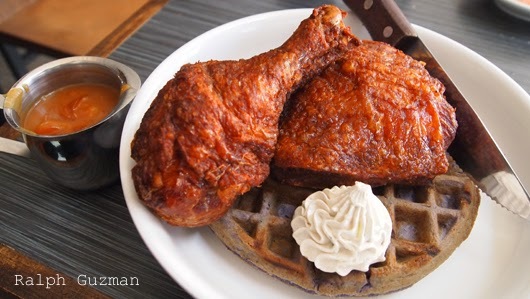 It was on an ube waffle, which gave the fried chicken — a staple at Filipino homes, by the way — a western twist. I reached nirvana, however, when I added macapuno jam and the anchovy-bagoong garlic chive compound butter. I rarely say “omg” as an expression, but that was how I happily reacted when I had the chicken with these two sauces/condiments. Yum. Yum. Yum. I will try to make this at home. They have other Filipino favorites, which I hope to try out the next time I am in New York: Kare Kare, Sisig, Bihon, Bistek and other dishes. They also have the ‘silogs (meat or fish with garlic rice and egg). I was so full, I didn’t have dessert anymore. The truth is, I’m not sure if they do. I’ve just visited their website and there are no desserts written there (please correct me if I am wrong). Perhaps, “dessert” for me was contenting my eyes with the other decors that added to the unique ambiance of the place. Wow, the cookbook of Aling Charing is a classic. And there’s Claude Tayag too! 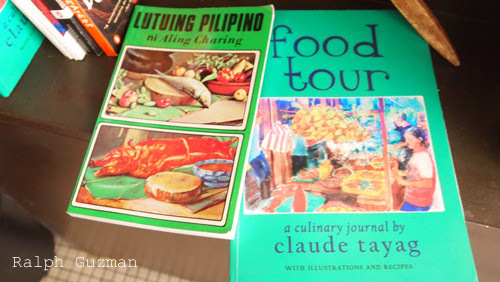 My lola (grandmother) had Aling Charing’s book! 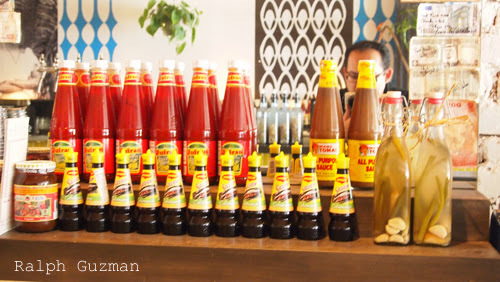 And a house in the Philippines wouldn’t be complete without sauces and seasonings such as Jufran, Mang Tomas and Maggi Savor. The place opened in 2011 by Filipino-Americans Nicole Ponseca, Enzo Lim, and Noel Cruz. Also with them is Miguel Trinidad, a Dominican chef. The restaurant has gotten positive reviews from prominent publications like the New York Times. Together with other counterparts in New York, they have showcased Filipino food on popular US shows like The Chew and if I am not mistaken, Good Morning America. This entry was posted in Rated by Ralph, Restaurants & Food Trips and tagged Filipino Food New York, Filipino Restaurant New York, Maharlika Restaurant New York, Maharlika Restaurant New York Reviews, Pinoy Food New York, RatedRalph.com, Where to find Filipino Food New York by Ralph. Bookmark the permalink.